There is always something a little special about spotting a Brown Creeper. They are so cryptic, for one thing; even when you are looking right at one, you aren’t quite sure you are seeing it. And so methodical, so single-minded in their foraging – scooting up the tree trunk, and then a beeline down to the bottom of the next – all business. I should get to know their vocalizations better, that would help. A good winter bird is a friend for life! 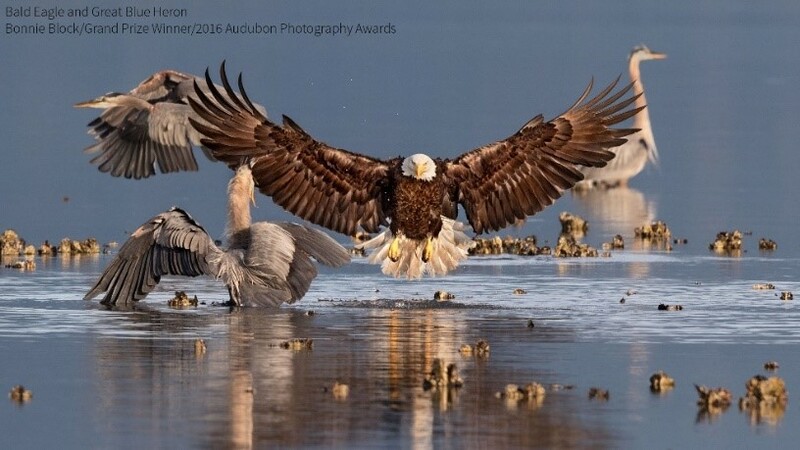 Mark your calendars: due to scheduling requirements, we are having two Audubon Afternoon programs in March, and both of them promise to be excellent. The March 5 program will feature Jennifer Ackerman, author of The Genius of Birds, on recent and sometimes surprising findings about bird capabilities and behavior. On March 12, Peter Marra, co-author of Cat Wars, will speak to us about the impact of outdoor cats on our bird populations. And a reminder that on February 26, the Friends of Dyke Marsh is sponsoring a program on “Saving Secretive Marsh Birds.” ASNV is a co-sponsor. Last chance – the deadline is February 24 for applications for our scholarship for the July Educators’ Week at Audubon’s Hog Island camp in Maine. If you are an educator, or if you know an educator you think might be interested, more information here. And we have a variety of workshops coming up. The Advocacy Workshop is scheduled for March 18; free, but requires pre-registration. You will have two opportunities to take a Birding by Ear workshop this spring, one on March 26 and one on April 30. Larry Meade will also be offering Spring Warblers on May 11. Be sure to sign up soon at on the ASNV site for our advocacy training workshop on March 18, 2017, 1:30 to 4:30 p.m. at Green Spring Gardens in the Annandale area near route 236 and the Beltway. See directions below. Registration starts at 1 p.m.
A People’s Climate March will take place on April 29, 2017 in Washington, D.C., and across the country. There is still time to apply for ASNV's scholarship to “Sharing Nature: An Educator’s Week,” July 16-21, 2017, at National Audubon Society’s Hog Island Camp in Maine. The application deadline is Feb. 24, 2017. More information can be found here. If you have questions, contact Mary McLean, Youth Education Chair. For further information about Hog Island, visit the Hog Island Website. Winter is a good time to walk around the lake checking for waterfowl and woodland birds. Tom Nardone leads. Sponsored by the Northern Virginia Bird Club. We’ll meet at Lake Newport and caravan to the other Reston Lakes as we check for our winter waterfowl. Bill Brown leads. Sponsored by the Reston Association and The Bird Feeder of Reston. Getting there: From Route 7, go west on Baron Cameron Ave, and turn north on Village Rd. (opposite Lake Anne Village Center). Located off Brown’s Chapel Road. Park near the tennis courts. 11452 Baron Cameron Ave.
Join us to check out the quarry for ducks and grebes and walk the meadows and woods’ edge checking for flocks of our smaller winter residents. Led by Toby Hardwick and Jean Tatalias. Sponsored by ASNV. Dixie Sommers leads this walk to scope the waterfowl on the river and check out Haul Road for sparrows, kinglets, woodpeckers, and eagles. Sponsored by Northern Virginia Bird Club. We’ll check out the pond in the wetlands and the thickets in the polo fields for a variety of habitats. Sponsored by the Reston Association and The Bird Feeder of Reston. Getting there: From the Dulles Toll Road, go south on Fairfax County Parkway. Turn right (west) on Sunrise Valley Drive. Just beyond the Herndon-Monroe Park and Ride, turn into 12700 Sunrise Valley. Park on the west (left) side of the building. Larry Cartwright leads this walk to check out lingering waterfowl and early spring migrants. Ospreys and eagles should be nesting by then, bluebirds investigating nest boxes, and Eastern Phoebes just arriving. Sponsored by ASNV. Getting there: From I-495, take I-95 South 7 miles to Lorton exit. Go left (east) on Route 642 to Route 1. Go right (south) on Rte. 1 and then left (east) on Gunston Rd, Rte. 242. In 4 miles, turn right into Mason Neck Management Area. We’ll meet at 8:00 at the Woodmarsh Trail Parking Lot, on the left side of the road, and then carpool into the state park. Bring state park pass if you have one. Elizabeth Fenton and Tom Nardone lead the walk through this park along the Accotink Creek and woods. Sponsored by the Northern Virginia Bird Club. This walk follows one of the great paved paths through Reston woodland along the creek where bird activity in Spring can be lively and varied. Sponsored by the Reston Association and The Bird Feeder of Reston.